Wouldn't it make sense to get the same unified data for your work as you can for your personal activity through the Quantified Self movement? As a first step we have started implementing the WorkTrail Hub which allows you to collect all kinds of work related data into your workflow and show it in our interface (especially useful with the work history). This makes it very easy to get a grasp of what you have done throughout your day to be aligned with what you have measured and logged actively in WorkTrail. 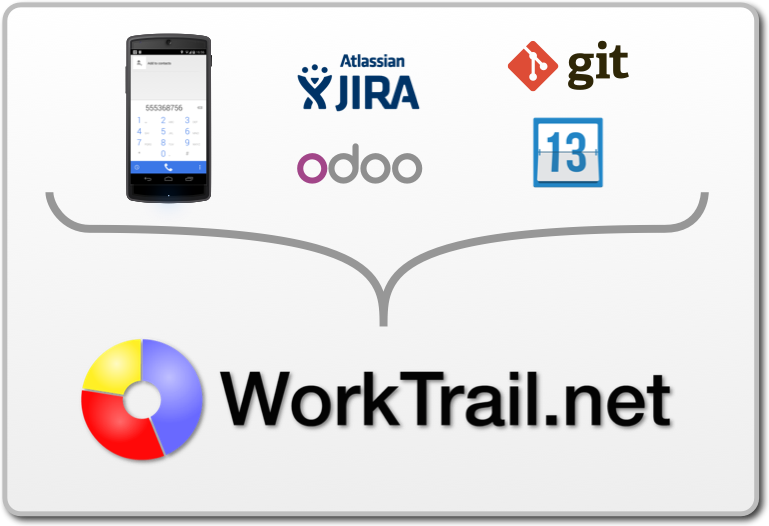 Using a set of APIs and tools you can import almost any kind of data into WorkTrail to give you more context about your work. Your telephone calls from your phone, including duration and to whom you have talked to. Your activities in ERP systems like Odoo (aka OpenERP). 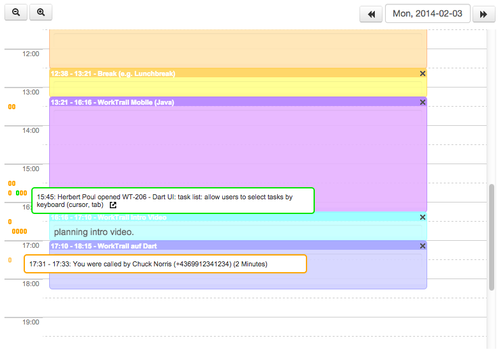 Your activities in Issue trackers like JIRA. As a developer your source control commits, currently supporting Git. 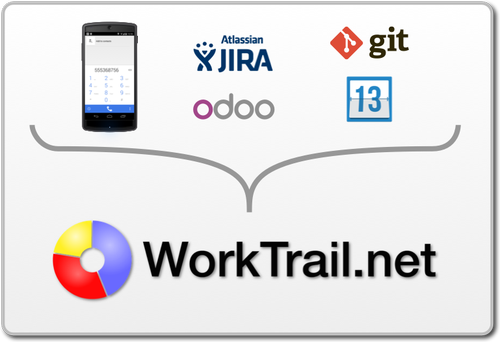 As there are thousands of apps which are used for work we wanted to make it easy to use your own set of tools to integrate data into WorkTrail. This is why we provide an open API for you to push and synchronize your data to (and from) WorkTrail. Head over to our Developer API documentation for more information. Project, Tasks, Work Entries and Attendances which are further used by the ERP system for billing, cost accounting, etc. It is very important for us to respect the privacy of our users and customers. 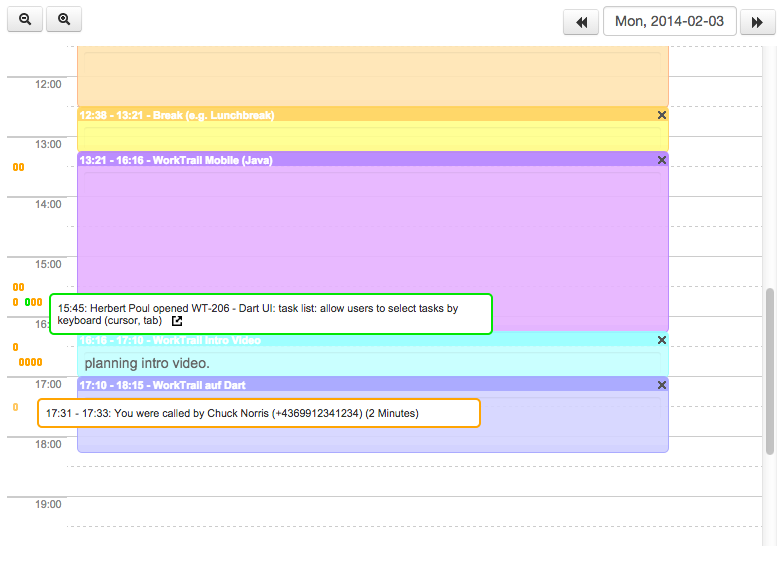 All entries in the Quantified Workplace is by default only shared with the one employee to which it is associated. Nobody else can see or access this data and you are in full control. In addition all apps accessing hub data have their own scope and access type (personal, company shared). This means that if you grant one app access to write and read your hub data, it will only be able to access data it stored by itself. If you need information or help to integrate your tools or reuse ours, don't hesitate to contact us.